Bill Dyla out fishing for blues. Bill Dyla of Southold grew up fly fishing the tributaries of the Great Lakes in Michigan, adapting his technique to the North Fork’s salty waters when he and his wife Kim began making a home here in 2008. 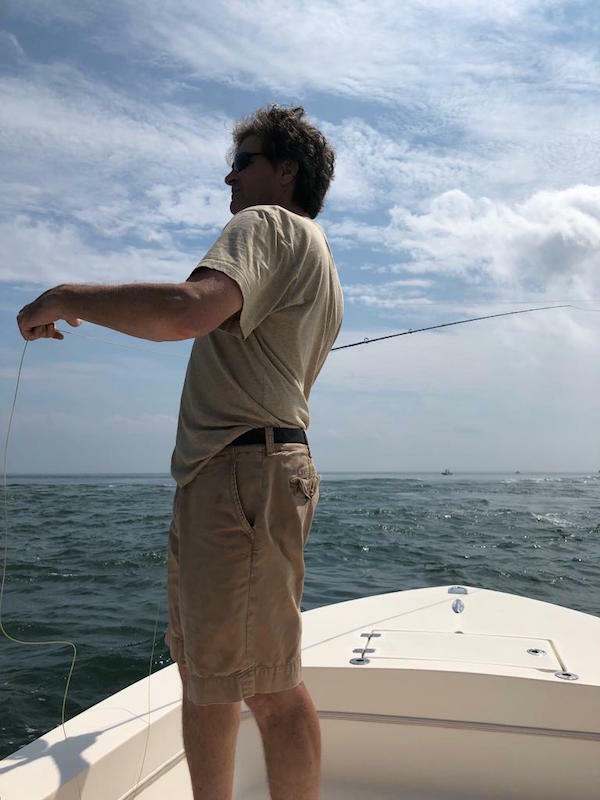 The best strategies are often born when an outsider takes a fresh look at a problem, and, for many local fishermen, catching bluefish can be a problem, especially when they’re brought home to the kitchen. That’s especially a problem for fly fishermen, who catch more than their share of this abundant local fish due to its prevalence in the upper part of the water column, where the fishermen’s flies skim the surface. 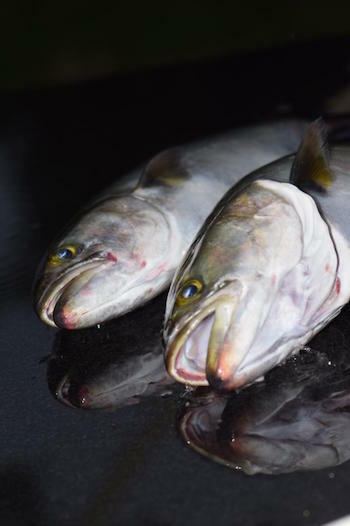 Bluefish has a reputation, not undeserved, for being a greasy, spongy fish with a strong flavor that many find off-putting. But a big part of the problem, says Bill as he and Kim prepared the fresh ingredients for a quick fish dinner, is the focus fishermen tend to place on catching big fish. “The big ones are eating tons of oily baitfish,” he said of larger, 20-inch-plus bluefish, like the ones fishermen bring home from a day at Plum Gut. Instead, he recommends bringing home the blues you catch in the 12 to 15-inch range (3 to 10 pounds), alive in salt water if possible (watch out for their teeth! ), and filleting them and cooking them as soon as you can. The cooking, then, is quite easy. Along with the fall bluefish run, quick-cooking or great-raw late summer crops like potatoes and corn are still abundant and make for easy side dishes. Make the meal a touch more perfect by capping it with an extraordinary apple cake, made with East End apples, of course. This simple recipe will make fans of the most diehard bluefish haters. It is important to use bluefish filets that are very fresh. We used local potato onions for the dish, but shallots or any small local onion will work fine. The preserved lemons add a wonderful flavor. They can be ordered at www.kalustyan.com or purchased at A Taste of the North Fork in Southold. In a 350-degree oven, heat a cast iron skillet large enough to hold all the filets. Remove the hot pan from the oven and add the butter. Place bluefish filets on top, season with salt and pepper. 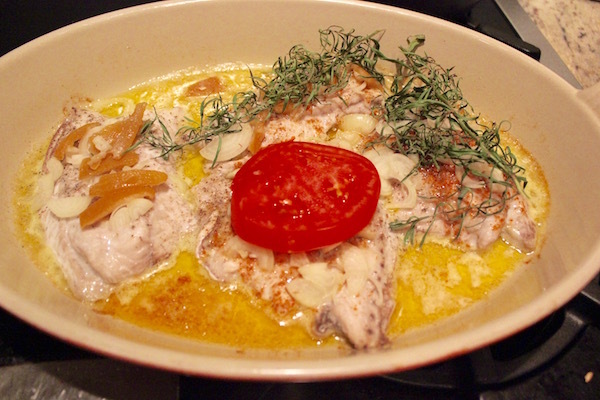 Cover with the sliced onions, tomato slices, preserved lemon and tarragon. Add a little more salt and a twist of black pepper and bake for 10 minutes until the fish is tender. Serve with local potatoes and corn on the side. As the fall harvest gets underway, the farm stands are brimming with a dazzling variety of local apples. 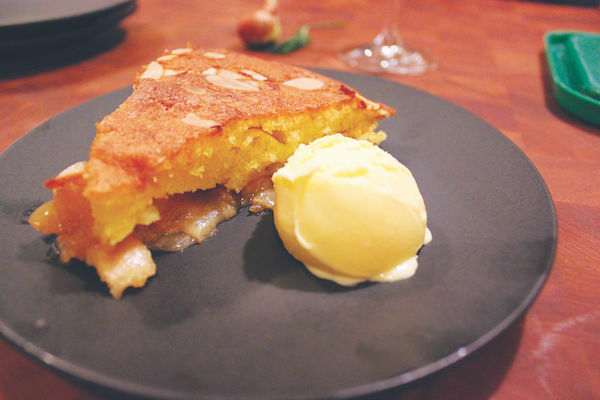 This easy and delicious apple cake is a favorite heirloom recipe from Alison’s mother Ella. Be sure to mix two or three varieties, pairing sweet and tart fruit for the best results. Jonagold, Honeycrisp, Granny Smith and Braeburn are all great choices. Place the apple mixture filling in a 10-inch ceramic or Pyrex pie dish. Cover the apple with spoonsful of the sponge mixture and smooth the top, before sprinkling with the flaked almonds. Bake in a 350-degree oven for about 35 minutes. The cake is ready when the top is an even golden brown and springy to the touch. If the top is browning too quickly during cooking, cover loosely with tin foil. Allow the cake to cool for at least 30 minutes. Serve warm or at room temperature with whipped cream or vanilla ice cream.